Standing Rock Reservation Chairman Dave Archambault called yesterday’s militarized police response to the water protectors opposing the Dakota Access Pipeline an overreaction, and called on the Department of Justice to intervene, according to his statement, published by myndnow.com. Officers moved in with tanks and riot gear. MPR reports that 141 people were arrested. Click on the link above for the full story. Hennepin, Anoka and Washington counties have sent deputies to support this militarized response. Efforts to stop the Dakota Access Pipeline have drawn attention across the country. As you will read below, the Quakers in the Baltimore region have been moved to take a stand. The publicity from the pipeline also has highlighted other problems in Indian Country. For example, a group of Dakota/Lakota youth credit their local Boys & Girls Club for helping them become leaders in efforts to protect land and water near the Standing Rock Reservation. They started a petition against the pipeline as well as a fundraiser on the website Change.org. On Standing Rock, like many other reservations, there is a severe lack of opportunities and resources for Native youth to grow and learn in a safe environment. Because of this, many young people struggle with addiction, and suicide is an all too common occurrence. One of the ways our community works to combat this is with youth groups, which provide mentoring, tutoring, and youth leadership programs for kids in Standing Rock. In fact, it’s thanks to our local Boys & Girls club that many of the young people behind this petition felt empowered to take part in the movement against the pipeline. But if our club can’t raise enough money, it’s about to shut down for good. Here is a link to the full post and to the fundraiser. Help if you can. For on the pipeline, fry bread, an art competition and Quakers, keep reading. Screen capture of video showing the militarized response to those working to stop the Dakota Access Pipeline and protect the land and water near the Standing Rock Reservation. On Monday, Energy Transfer Partners again started work on the Dakota Access Pipeline near the Standing Rock Sioux Reservation in North Dakota. It followed a Sunday ruling by a federal court judge that allowed construction to resume. The work began in spite of a federal request for a voluntarily pause in construction, according to a story in Minnesota Pubic Radio. The renewed work triggered peaceful civil disobedience and 27 arrests of those trying to protect the land and water. Anna Lee, Bobbi Jean and the Oceti Sakowin Youth who are working to stop the pipeline posted an update with a video of the arrest for criminal trespass of Hollywood star Shailene Woodley (it’s long, look around the 1 hour, 59 minute mark). 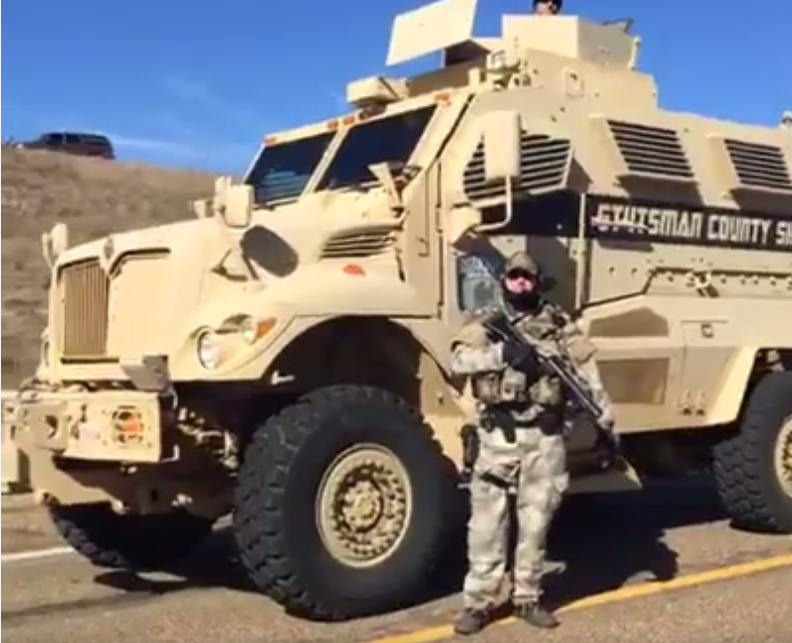 The video has stunning images of the militarized response, with helicopters, armored trucks, and heavily armed men in camouflage. In our blog yesterday, we included a list of the denominations that had issued statements on the Dakota Access Pipeline. Since then, we learned that we missed some. Those taking a position include leaders from: the Episcopal Church; the Mennonite Central Committee (Central States); the United Church of Christ; the Minnesota Annual Conference of the United Methodist Church; the ELCA; the Unitarian Universalists, and the Presbyterian Church USA. Please let us know if we have missed any statements from religious leaders. We will continue to update the list. Quick background: The proposed pipeline would pass under the Missouri River, just one mile from the fresh water intake for the Standing Rock Reservation. The Pipeline also would pass through lands sacred to Standing Rock, including burial grounds. The pipeline’s original route took it within 10 miles of Bismarck, but concern about the potential impact on the Capital City’s drinking water lead to a reroute near the reservation. Things are currently in limbo. On Sept. 9, a federal judge turned down the Standing Rock Nation’s request to stop pipeline construction, according to MPR. The judge concluded that the Army Corps of Engineers had followed the law in approving the project. That same day, the federal government ordered “work to stop on the segment of the project in question, asking Energy Transfer Partners to ‘voluntarily pause’ action” on the culturally significant areas. According to the websites theantimedia and Unicornriot, law enforcement in North Dakota has begun arresting those trying to stop the Dakota Access Pipeline Project near the Standing Rock Reservation. Multiple lockdowns are taking place at two Dakota Access Pipeline construction sites. All work has stopped. While a surveillance plane and helicopter circle overhead, police on the ground have blocked all road access to both sites. Approximately 100 riot police have come to at least one site, armed with assault rifles and less-lethal weapons. Around 20 people have just been arrested at the site of the #NoDAPL lockdown, including medics and two Unicorn Riot journalists. As arrests are under way, Facebook is censoring our live video stream. Healing Minnesota Stories cannot assess what actions Facebook did or did not take. Here is an archived video link by UnicornRiot that was working when we tried it at 7:05 p.m. CST. This action against comes after private security guards used attack dogs earlier this month on those trying to protect water and sacred lands. The Dakota Access Pipeline would pass under the Missouri River one mile from the Reservation’s fresh water intake. The route also crosses sacred Lakota lands. The original route had the pipeline passing near Bismarck, N.D. It was rerouted because of concerns an oil spill would contaminate the capital city’s drinking water. There is clearly less concern about the drinking water for Standing Rock residents. Attack dogs are a particularly vicious form of crowd control. They are meant to terrorize and intimate, physically and psychologically. The most recent example of using attack dogs comes from the Standing Rock Reservation in North Dakota. Lakota people and their allies are peacefully gathering trying to stop the Dakota Access Pipeline. The Pipeline would tunnel under the Missouri River just one mile from their fresh water intake. The project also would cross sacred lands and burial sites. While the pipeline project was pending in the courts, the pipeline’s backers took a provocative action, bringing in heavy machinery into an area identified to be an old Native American burial ground. Dakota Access Pipeline backers responded to the standoff by bringing in private security with mace and attack dogs to scare and hurt the protectors. There are a number of image of the dog attacks, but none in the public domain that we can reproduce in our blog. Check out the September 3 blog of Censored News to see some shocking images, and also Common Dreams. Attack dogs were used against Civil Rights protesters in the 1950s and 1960s. In fact, as Healing Minnesota Stories Founder Jim Bear Jacobs pointed out in a recent Facebook post, an image of attack dogs used against Native Americans still is prominently displayed in the Minnesota State Senate Chambers. Senate mural: “The Discoverers and Civilizers Led to the Source of the Mississippi.” Note the threatening dogs in the lower left corner behind the priest. 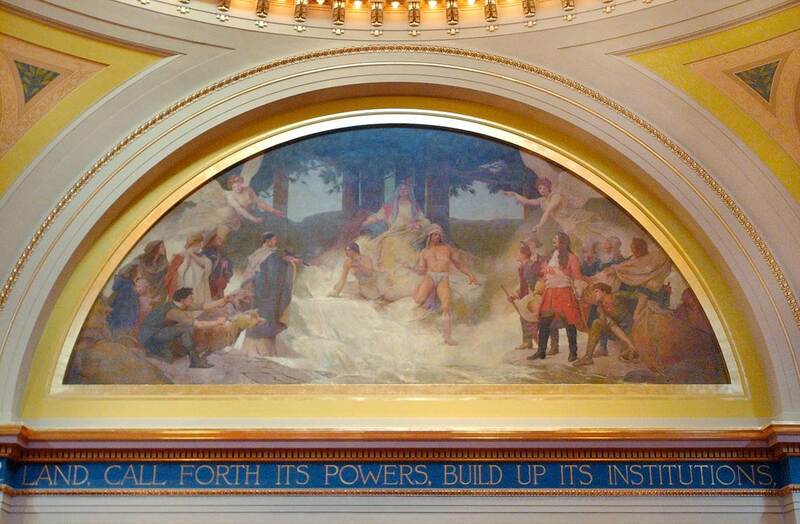 Installed around 1905 at the time of the Capitol’s construction, the mural shows a Catholic priest among a group of so-called “civilizers.” He extends a Cross towards a Native man and woman. (They are depicted in historically inaccurate near nakedness to give the idea that they are uncivilized.) Behind the priest, a man restrains two threatening, snarling dogs. The not-so-subtle message: Accept the Cross or the dogs will be let loose. After a thorough vetting of art in the Capitol this past year, an Art Subcommittee of prominent state leaders found nothing wrong with this image. The subcommittee’s final report was silent on removing this painting, leaving any changes up to the Senate itself. Apparently Minnesota’s political leaders would rather leave a racist image in place than risk political backlash from a proposed change. Assume for a minute that the Dakota Access Pipeline had stuck with its original route, passing near Bismarck. Ask yourself what would have happened if a number of Bismarck residents had organized a protest against the pipeline? Would the Dakota Access Pipeline’s financial backers brought in security guards with mace and attack dogs against middle class white people? My opinion: No. It was OK to use dogs in Standing Rock because there are still people who believe Indians are less than white people. … the Department of the Interior, Department of Justice and the Department of the Army issued a joint statement saying that they would pause construction until they can decide whether they need to reconsider past decisions that have been made regarding the project. In addition, they are asking for tribal consultation in re-evaluating how huge projects get fast-tracked the way the Dakota Access was, and deciding whether new legislation should be introduced to ensure that tribes are included in these decision-making processes moving forward. In other words: the U.S. government has acknowledged that the manner in which this pipeline was approved was questionable, and should be looked into, and that tribes should be better included in the future. This is HUGE! We are thrilled, and know that this would never have happened without the support of our allies from across the country and around the world. Standing Rock youth have an ongoing petition to Stop the Dakota Access Pipeline. By turning their dogs loose on protestors, the security guards hired by Dakota Access, LLC acted in a reckless and inhumane manner. The guards had no uniforms, drove vehicles with out-of-state plates, and appeared to have little or no training. It’s unclear whether or not they’re even licensed to operate in the state. The North Dakota Private Investigation and Security Board must investigate the actions of the private security guards hired by Dakota Access and ensure they are properly trained and licensed to operate in North Dakota. The Sierra Club has helped plan more than 150 solidarity events across the country — with thousands of people signed up to attend — to support the Standing Rock Sioux in their courageous stand against the toxic Dakota Access fracked oil pipeline. In the Twin Cities, there is one event set for Tuesday (tomorrow), Sept. 13, 5 p.m. at Mears Park in St. Paul, 221 5th Street SE in downtown. Click here for more. There also is a vigil scheduled in Northfield starting at 6:15 p.m. tomorrow, Sept. 13, across from the Northfield Post Office, 14 Bridge Square. Click here for more. The Twin Cities Daily Planet Community Voices section reported on efforts by Standing Rock youth to get Minneapolis-based law firm Fredrickson & Byron to drop Dakota Access Pipeline LLC as a client.